The UK and France have pledged to work together and "step up" moves to improve the migrant situation in Calais. A statement, released after Home Secretary Amber Rudd met her French counterpart Bernard Cazeneuve, said both countries would resolve the situation through "close co-operation". It said the UK and France would also further secure the port and tunnel. The show of unity follows calls to allow migrants to lodge UK asylum claims on French soil. But this plan was dismissed by a Home Office source as a "complete non-starter". The Jungle camp in Calais has become the focal point of France's refugee crisis, with about 7,000 people living there. Further secure the port. A total of 100 million Euros have already been provided by British authorities to reinforce security, and the French authorities have been providing 1,000 police day and night to prevent intrusion. This scheme has just been recently reinforced with 160 additional officers. Ms Rudd and Mr Cazeneuve said: "The two countries recognise the humanitarian situation in Calais that affects both countries and the need to step up joint efforts to improve the situation in Calais." Reality Check: Will migrants be allowed to claim UK asylum in France? On Monday, Xavier Bertrand, the president of the region, said Calais migrants should be allowed to lodge UK asylum claims in France. Under the 2003 Le Touquet deal between France and the UK, Britain can carry out checks in Calais on people heading for the UK, while French officials do the equivalent in Dover. But Mr Bertrand said he wanted a "new treatment" for asylum seekers trying to get to the UK and said people living in the Calais camp known as the Jungle should be able to apply at a "hotspot" in France rather than waiting to reach Britain. Those who failed would be deported directly to their country of origin, he said. Current rules known as the Dublin Regulation say refugees must register in the first European country they reach. This country usually takes charge of their asylum claim. Many try to reach the UK by hiding inside vehicles entering the nearby port and the Channel Tunnel. Mr Bertrand, who is the president of Hauts-de-France region, does not have the power to change the treaty, but some of the candidates looking to win next year's French presidential election, including former President Nicolas Sarkozy, agree it should be reformed or scrapped. Debate over border controls was a key issue in the EU referendum campaign, with David Cameron claiming the Jungle could move to England if the UK left the EU. But just weeks after the warning, the then-PM and French President Francois Hollande agreed a "mutual commitment" to keep it in place. After the Brexit vote, new UK PM Theresa May and Mr Hollande reiterated the commitment. The BBC's Paris correspondent Hugh Schofield said it was possible there could be a "looming confrontation between Britain and France on Calais, but it's not going to be here and it's not going to be now". Why don't Calais migrants claim asylum in France? Under EU rules, known as the Dublin Regulation, asylum seekers should claim asylum in the first safe country they come to. British officials must also take responsibility for claims made elsewhere in the EU if the person can demonstrate they have close family members living legally in the UK. Electronic fingerprinting means many who make it further into Europe will end up being sent back to Italy or Greece, where many first entered the EU. UK politicians say under the Dublin rules, migrants in Calais should claim asylum in France if they need protection. But many migrants say their life in France is "no good", and they hope for better opportunities in the UK. 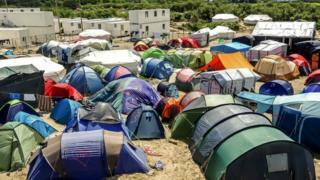 Meanwhile, Labour leader Jeremy Corbyn, said he had "seldom seen anything so disgusting as those fetid camps in a land of plenty". He said he had raised the issue of the camps with French and UK authorities. A spokesman for the prime minister said the UK and France are committed to the Le Touquet agreement, and the issue of the Jungle was a matter for French authorities.